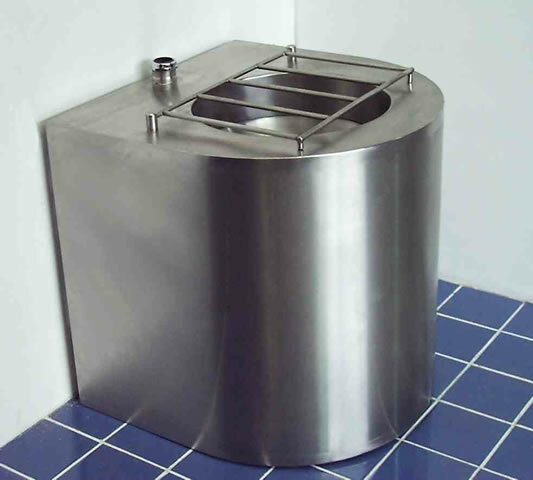 The SDS floor standing slop hopper is manufactured from 304 grade stainless steel and incorporates integral wall fixing flanges (not shown in photograph) and a hinged bucket grating. It is supplied with a plastic P or S trap, and a top entry flush connection. Optional extras are cisterns (in plastic or stainless steel) and stainless steel P or S traps. If required the unit can be manufactured with a back entry flushing inlet and concealed fixings. Delivery lead time is usually about 10 working days from order, with free packing and carriage to the UK Mainland.